Your dollars and your donations go a little farther at Fabulous Finds. Revenue from our resale store benefits Women’s Information Services, Inc. (WISE), the domestic violence and sexual assault agency serving residents of Mecosta, Osceola and Newaygo counties. Stocked with donations of clothing and small home goods, Fabulous Finds can outfit your home or wardrobe for less. Fabulous Finds also supports WISE clients with a voucher-based shopping system. Clients shop here for clothing while in shelter, and later furnish their new homes as they begin to rebuild their lives. 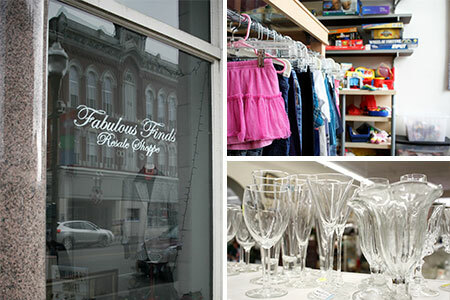 Fabulous Finds accepts donations of quality used clothing for women, men and children. We resell clothing in good condition, free of stains and tears. Clothing that cannot be sold will be recycled through World Mission. We also accept donations of small home goods -- pots and pans, dishes, countertop appliances, and some bedding. We also accept children's toys and baby "gear," like pack-n-plays and high chairs. We no longer accept any donations of large furniture, including electronics of any kind or CRT televisions. Donations can be dropped off at 103 S. Michigan in Downtown Big Rapids any time during our regular business hours. You can also leave donations at our door step if we are closed, and we will process your donations when we return. Call us at (231) 796-5840 with any questions. Donations intended for the shelter can be dropped off at Fabulous Finds, but we’d prefer you take them directly to the shelter. To schedule a shelter drop-off, call (231) 796-6600 and press 0 to speak to an available advocate. Check out our shelter wish list to see what's needed. Tue: 11:00 a.m. to 4:00 p.m. Wed: 11:00 a.m. to 7:00 p.m.
Thu: 11:00 a.m. to 6:00 p.m. WISE, Women's Information Service, Inc.